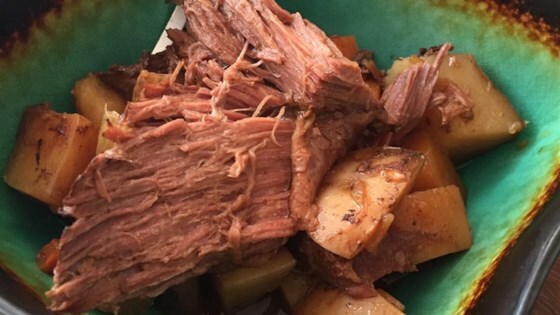 "Moist and juicy pot roast done in a slow cooker with carrots, onion and potatoes." Season the roast with salt and pepper to taste. Brown on all sides in a large skillet over high heat, about 4 minutes per side. Place the roast in the slow cooker and add the soup mix, water, carrots, onion, potatoes, and celery. Cover and cook on Low setting for 8 to 10 hours. Make a top-rated pot roast that’s quick and easy. why do people take a recipe and turn it into another totally differtn recipe using it as a review? Just create a new recipe.